What Type of Acne Do You Have and How to Treat Them? You are here: Home / What's Trending in Skincare / What Type of Acne Do You Have and How to Treat Them? Acne vulgaris, or more commonly known as acne, is a common skin disorder that affects face, chest and back of adolescents and young adults. The adverse effects of acne have led to an onslaught of over the counter products for a cure. A safer and effective option would be to consult an accredited dermatologist. Trained in medical and cosmetic dermatology, they will be able to provide comprehensive diagnosis and solve skin problems with precise treatments. On your own, it may be a challenge to understand and differentiate the different types of acne. Hence, we endeavour to put together here some tips with dermatological science and how to treat the different acne types, to hopefully help you in making wiser decisions about your skin. Each individual experiencing acne symptoms may have predominantly one form of acne or a combination of the different types at one time, which regardless of types or forms, frequently originate from comedones. Comedones (which are widened hair follicles filled with skin debris, bacteria, and oil) can be open or closed and are usually considered non-inflammatory acne lesions. Closed comedones, or whiteheads, are small plugged follicles that are not exposed to the skin. They are seen as tiny bumps on the skin surface and tend to occur at the forehead and chin. Open comedones, or blackheads, are small follicles with a dilated opening to the skin. The distinctive black color of open comedones is due to the oxidation of the follicle’s content – a buildup of keratin and oil. Although comedonal acne is as it is often a mild form of acne vulgaris, it can be the hardest to treat as the comedones are firmly rooted within the follicle. Chronic sun exposure and radiotherapy have been cited as physical factors that include comedone formation. UV damage to our skin layers initiates changes in the hair follicles found on the skin. Comedone formation can also be attributed to an underlying genetic tendency of the skin to be inflamed, producing these tiny seeds that slowly rise to the surface of the skin. This means that our genetics may determine how inclined we are to comedone formation. Comedone formation (comedogenesis) can also be caused by certain types of chemicals. Such substances can include ingredients found in some cosmetics, such as isopropyl myristate, and red dyes D&C. How to treat open comedones? Open comedones are best treated with a mixture of chemical peels containing salicylic acid, lactic and glycolic acids to keep oil production under control. Alternatively, opting for carbon laser peels can also be a solution to shrink oil glands and reduce oil production. A good cleanser is also important to keep the comedones away. You may reach out for pore strips in an attempt to ‘rip’ away those blackheads, but these strips only physically remove bits of keratin and oxidized oil. Oil debris accumulates, and the problem recurs. Using oil blotting sheets is also not recommended, as it may strip off your skin’s necessary oils. It causes the skin to feel ‘dehydrated’, initiating an increase in oil production to compensate. For individuals with skin that gets too oily in the day, it may help to just wash the excess grease off with a good cleanser instead of relying on blotting sheets. For the effective types of cleanser, look for labels ‘dermatologist-tested and formulated’ for products tried and tested by dermatologists for clinical efficacy. 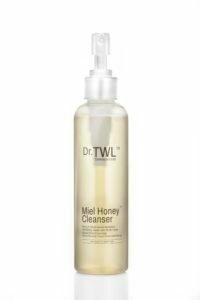 Miel Honey™ Cleanser is formulated with medical-grade honey to effectively cleanse away dirt, grime and bacteria. Honey is a naturally derived emulsifier and possesses anti-bacterial properties. Unlike chemical lathering agents, this honey cleanser cleanses the face effectively without excessively stripping away the skin’s natural oils. Cleansers that leave your skin feeling squeaky clean frequently contain a strong lathering agent called Sodium Laureth Sulfate (SLS), which are cheap emulsifiers that are also found in detergents for dish washing for example. Avoid such ingredients as it strips the skin dry of all oils and moisture, leaving the skin red and flaky. How to treat closed comedones? Closed comedones can develop into more severe forms of acne. When the comedo ruptures, it may lead to the development of inflammatory lesions such as papules or pustules. Never try to squeeze and extract the whiteheads yourself as it introduces bacteria. To gently extract comedones, a specialized machine with a vacuum handpiece is frequently used in a dermatologist’s office to extract comedones without pain or scarring. In this treatment, the facial skin can also be treated with a customized blend of fruit-based acids to exfoliate the skin. Prescription creams containing topical retinoids such as tretinoin are often used by dermatologists as treatment for acne, along with chemical peels and microdermabrasion. Cystic acne encompass larger and often painful bumps that can appear on the face, chest or back. When comedones get infected by bacteria and are left untreated, the inflammation can lead to cystic acne. Picking on your pimples can also cause an excess growth of a skin bacteria called Propionebacterum, also leading to and aggravating cystic acne. Genetics play a part in determining the prevalence of cystic acne. If you have a family history of the condition, it is recommended to seek medical treatment of the condition before it gets severe. In severe acne conditions, do consider an appointment with dermatologists as you will likely need precise medical care (beyond over the counter products) with anti-acne prescriptions and treatments. Such medications, e.g. isotretinoin, requires close medical supervision, as it may cause side effects on the liver and cholesterol levels, and best managed by an accredited dermatologist. Dr.TWL Dermaceuticals Launch Event What’s In My Cleanser?